There are a number of ways to store seafood but we believe we've found the best & most effective way to keep your seafood fresh. Below are the steps to store your seafood in the freezer. Remove fresh fish from the styrofoam box. DO NOT wash the fish! (especially the slime from the scales of the fish) The slime from the scales will help keep the fish fresh. 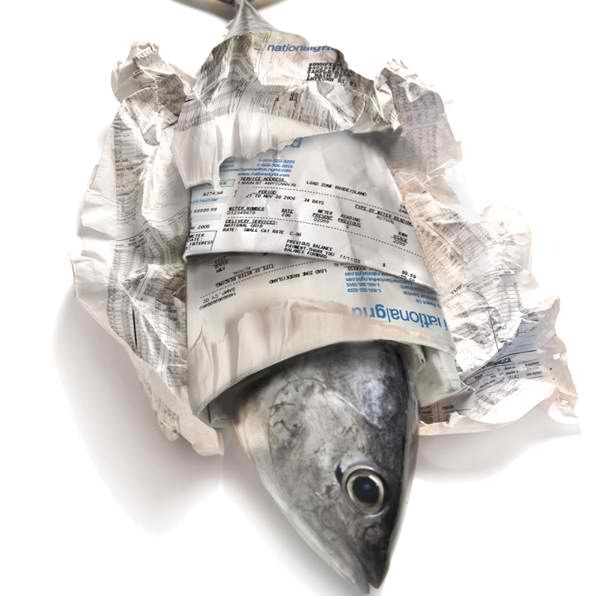 Pat dry the fish with a paper towel & wrap the fish up in newspaper (to absorb moisture) as shown in the picture above. Store the wrapped fish into the freezer & defrost in the fridge before cooking.